The Tau battlefleet arrives at Al’gel, where it will attempt to stop an impending ork WAAAGH! before it disrupts the entire sector. A massive Tau armada has been assembled in the Dal’yth Sept, with the intent of making a preemptive strike against a growing Be’gel (ork) threat in the nearby Al’gel System. The presence of orks in the Al’gel System has been known to the Tau High Council since the launch of the Second Sphere Expansion more than 2,700 years ago, but as the creatures on these worlds appeared content to war amongst themselves, there seemed no reason to devote limited resources to their eradication. But, in recent years, there have been disturbing signs that the orks’ social dynamics are changing. Hidden surveillance satellites have observed clear signs of a WAAAGH! in the process of development. The Al’gel System consists of five ork-inhabited worlds and an immense 20-mile-wide accumulation of space debris—asteroids, spaceships, and ork-built structures—that is reminiscent of a space hulk. The second world is home to the ork warlord Uzgul da Despota. Given the sizable population and industrial advantage of Al’gel II, it is only a matter of time until Uzgul conquers the rest of the system. Scholars who have studied the Be’gel philosophy have noted that when ork populations reach a “critical mass”—and when led by a dynamic leader—the xeno physiology undergoes a metamorphosis. Orks cease to fight amongst themselves and turn their attentions to an interstellar migration. As all the signs are there, this ork menace must be dealt with—or it will pose an unacceptable threat to the Dal’yth Sept.
To this end, Aun’Wei—supreme leader of the High Council—has ordered a preemptive strike. The naval arm of this invasion is designated Kor’vattra Or’es Shi [Fleet Powerful Victory] and commanded by Kor’o Che’lei [Admiral Lightning], a distinguished and veteran naval commander of many years’ service to the Greater Good. 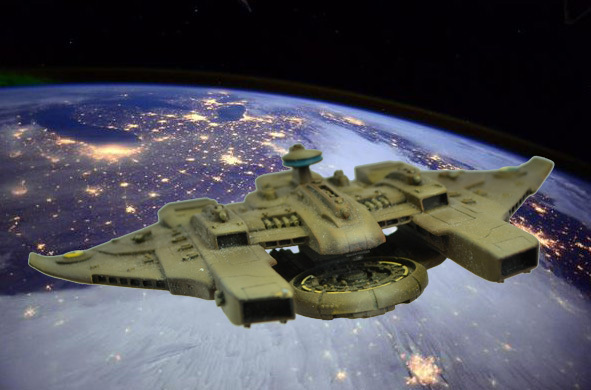 An Or’es El’leath carrier, in orbit over the Dal’yth Sept homeworld, will serve as the fleet command ship during the Al’gel Campaign. The land contingent of the strike force–designated Kavaal Kais Or’es (Battlegroup Powerful Skill) is commanded by Shas’o Mont’yr Vral (Commander Bloodsword), a former subcommander and prodigy of the famed Commander Puretide. More than 200,000 Tau fire warriors will be deployed during the Al’gel Campaign. According to Admiral Lightning, the only known ork naval presence is in orbit around Al’gel II—and thus the military campaign will begin with an attack designed to destroy the growing ork fleet. Once destroyed, interplanetary travel will fall under the control of the Tau fleet—and the individual ork planets will be isolated and unable to consolidate their considerable land-based forces. At last, that is the strategic assessment of the High Command. There remains some dispute among Tau commanders about whether the land campaign should begin by targeting the weakest ork planets—or strike directly at the greatest military threat, the powerful warlord on Al’gel II.That decision is, apparently, still to be determined. 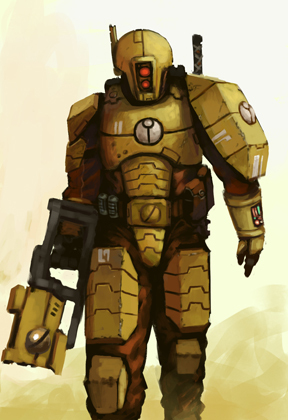 Artwork of Tau warrior is courtesy of Diego Fonteriz. See his artwork at http://fonteart.deviantart.com.